I’m sure this has been written about many times in many places but whenever I install Windows 8.1 or Windows 10 on my machines/VMs, I seem to keep forgetting so this would be a good way to remember. If you are reading this and benefit from it, even better! Now, I stopped using command prompt ever since I started using PowerShell meaningfully. So for me, there is no use of that command prompt items in the menu. I would rather have PowerShell instead. Little did I know how easy it is to replace it! 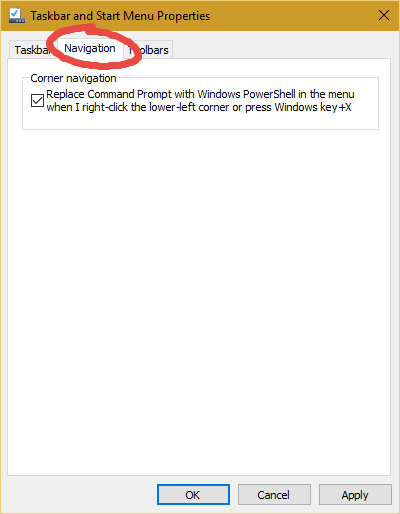 Once there, all you have to do is check the checkbox that reads “Replace Command Prompt with Windows PowerShell in the menu when I right-click the lower-left corner or press Windows key+X”. Where’s my easy button! Cheers!